Lately I have been admiring the open shelving that I have seen in different kitchens. I just didn’t think it would work in mine. Well, Friday I found myself in a mood, and when I get in a mood, the only thing that calms my nerves is some kind of project. I was had shown Matt the picture of Home Stories A to Z’s gorgeous open cabinet display, and told him I wanted something similar. He said, “Go for it!” So, I did. I started with just one…the one on the right. I took the cabinet doors off and sealed the holes with wood filler, then I took the shelving out. I decided to paint the shelves white and the background aqua. I already had a sample from Lowe’s, which was more than enough paint. It took two coats on each the shelves and the inside of the cabinet. I am extremely impatient, so I dried each with a hairdryer in between coats to speed up the process. As soon as they were dry enough, I popped the shelves back in and started dressing them up. I wanted beachy tones…white, aqua, silver and light lime green. So, I started poking around the house trying to find things that would fit my scheme. By Saturday morning, I was itching to open the cabinet that was on the other side of the sink. The only problem was my dishes. I have been living with a mish mash of red dishes for the past few years, and they just wouldn’t do. I finally had an excuse to buy new white dishes! Let me say now, I don’t just wake up and decide to buy dishes…this is something we have been talking about for a while…or something I have been complaining about for a while. I scouted out a few stores, and found nothing I liked. A friend had told me that she saw some cute white iron stone-like dishes at Walmart, so in a last ditch effort, I tried there. You know what? They had just what I was looking for! I was a little shocked. I bought two sets of 16 for $50. Then we made a trip to Lowe’s where I spent another $3 on another paint sample to paint the left cabinet. I feel like my chalkboard menu stands out a little more now! 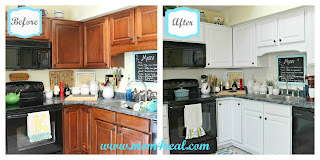 I love the way they turned out, and opening up those two cabinets gave our kitchen an entirely new look. It doesn’t hurt that including dishes it only cost $53 for the update! Next week, I am painting the countertops to finish it off, and I cannot wait! I feel like it is all finally coming together! It feels like it was only yesterday that I revealed my White Painted Kitchen Cabinets. There is a new update to be seen! 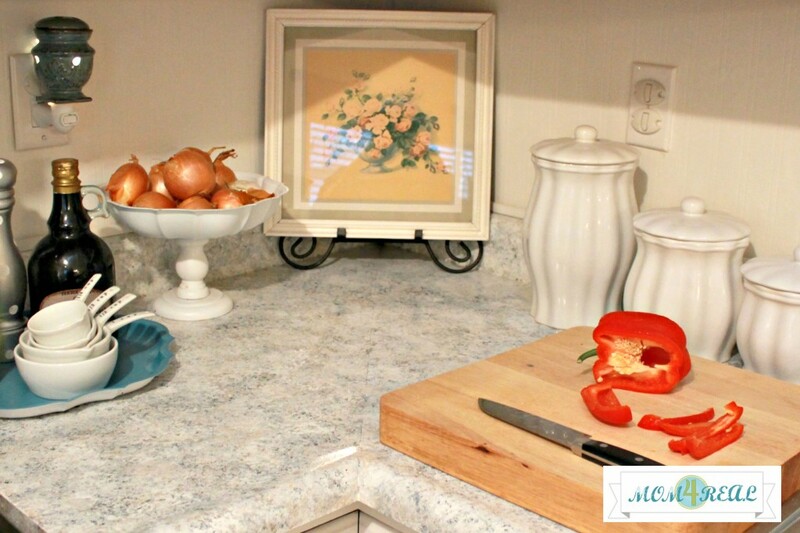 I just painted my countertops…yep, you read right…my countertops have been painted to look like granite. Congratulations and your cabinets look beautiful – I love, love, love that aqua colour!! Love the open cabinets!!! Congrats on your new adventure! Love the open cabinets and what great color. Congrats to your new venture. Congratulations!!! So exciting! And your kitchen looks ah.maz.ing! 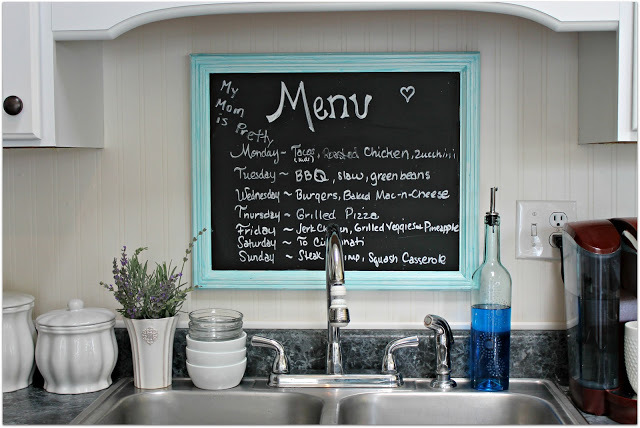 I love the chalkboard over the sink and the painted window especially! You rock! Love your kitchen update and congrats on the TT&J gig! You are already rockin’ 2013. Have a wonderful week! I can totally picture you waving your hairdryer to dry the cabinets Jessica!! Sounds like something I would do!! Love how they turned out – such a pretty blue color! And big big Congrats on contributing to TT & J – you are a great fit and I can’t wait to see your posts there!! OMG I love it! That aqua color is perfect against the white cabinets. I’m so jealous. I took the doors off a few of my cabinets but had to paint them white because I have an ugly green countertop that would look horrible with aqua. Can’t wait to see your painted counters – I want to paint mine so bad but am afraid the paint will peel off. Your kitchen looks amazing! 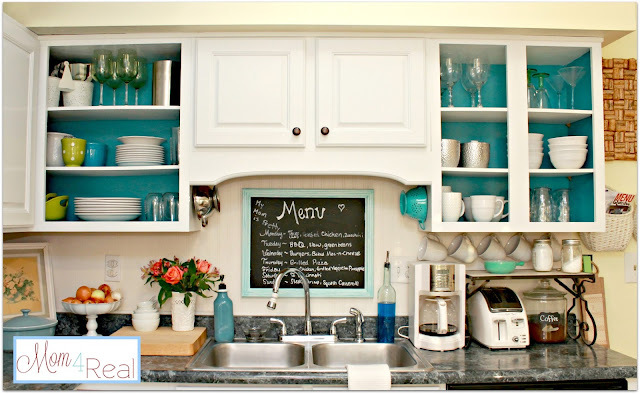 Love how your kitchen looks with the open cabinets and the pop of turquoise! So pretty and fresh! I have an open cabinet with white dishes too but I’m still deciding how to finish the back. I like how you just went for it!!! HUGE congratulations, Jessica!! I’m so excited to see you over there! and I love the open cabinets – the aqua is gorgeous! That is an unbelievable cool, fresh look for your kitchen and your news is pretty stinkin’ amazing! CONGRATS!!! Hey, Jessica!! 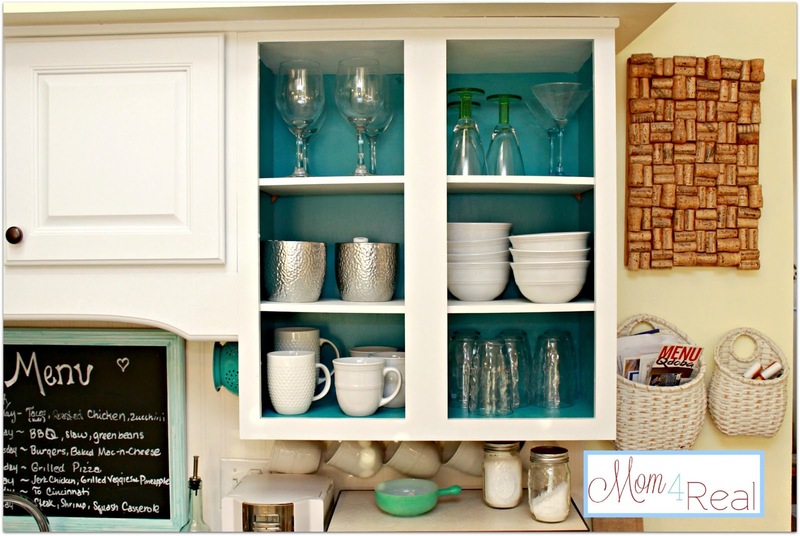 love what you did with your cabinets, so colorful and pretty. Looks fantastic. And congrats on working with Jen, she is a doll! 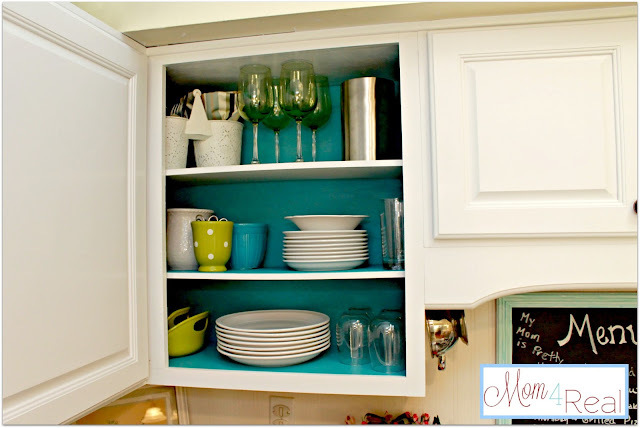 Hi, Jessica, your kitchen cabinet update looks great, so colorful and pretty. I love what you did. And congrats on working with Jen, she is such a doll! If this posts twice, sorry! Jess Jess..you are THE WOWman! I can’t believe it..first- I love the new look…and those counters are just going to finish it! :) Also- Hello TT&J mama!! You did good…you have worked so hard and I am so excited for you! Of course I will be there…with bells on! Congrats on the contribution to TT&J! Also, the cabinets look awesome! I really need to finish mine, as in, paint the inside of the doors and the backs. Beautiful job! Love your cabinets! The color is great! Congrats on TT&J! Have a great week. Congratulations on TT&J! Your kitchen looks fabulous already and cannot wait to see the counters. Love it! The color is great and it really pops! Congrats on the TT&J job! I can’t wait to see what you do! I love your kitchen, the colors are perfect. I’m totally with you on being impatient! Congratulations on working with TT&J! That’s NICE!!!! Love it. That’s the color of my dishes. Parties rockin in the house tonight! Congrats. LOVE your cabinets…I want to go rip off some doors now LOL. There is no way my husband would be as willing though. I love how the turquoise totally ties it all together with the dining nook. Nice work! I love, LOVE your open shelving! And, the color you chose is fabulous … your pretty dishes pop beautifully against it! And, CONGRATS to you … what a well-deserved honor. I’ll be tuning in, for sure! Hope to see you at Haven. Raising a big fist of tatertots and a huge cup of jell-o in your honor! You are a rockstar and deserve to be hanging out with Jen! Love the cabinets too and those dishes!! Congratulations! What exciting news! I absolutely love the kitchen. I found a mason/decorative jar that I loved and our new kitchen makeover is centering around aqua/turquoise and I adore it! I havent’ posted anything yet but I am loving the color! I love that you painted the inside of the cabinets. It looks great! Oh, never mind. I did post the hutch but the fence wood backsplash and mason jar chandelier are yet to come! Love your blog and thank you for visiting mine! It is lovely. I love the colors so very much. It came out awesome, Jessica! Love the colors! Congratulations Jessica,I love Tatertots and Jello! I will be sure to stop by on the 4th Thursday. I love the cabinets too! Congrats! And I LOVE the cabinets! That turned out so well – great job!! OMG! What a difference it made to take off your doors and paint the inside with that gorgeous color! I am so amazed that you had so many green and aqua items to place on the shelves! You really hit a homerun with this as well as on T&J! Your cabinets look great. I’m anxious to see your countertops and how you do them. I’m wanting to do mine. Cute! I love that bright teal on the back of your cabinets. I took a door off too, just to dip my toe in the water a little bit and see if I could hack the new trend. You know what? I’m likin’ it! I threw baskets in my shelves and now my vitamins are within easy reach and I still get the “open concept” (but with all my junk hidden in the baskets). Congrats on your TT&J news! Absolutely GORGEOUS Jess! love love love love love it! love the open shelving and the bold pop of color. good for you! I love the bold color choice for the background. And congrats on the tt&j contributing position! I’m so excited for you my friend! And so well-deserved! 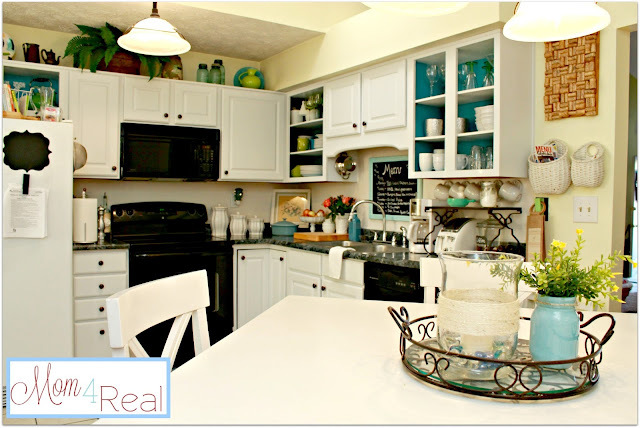 This is the most beautiful kitchen redo I’ve seen in a long time, the colors are so what I would love in my home. Fantastic Jessica….I so love the open cabinetry and the color is perfect!!! Can’t wait to see your countertops! I love the colors and I’m so glad you found some white dishes that you like :) and for the TT&J venture~Congratulations!!! I’m so happy for you and I can’t wait to watch you grow! That looks absolutely amazing. I love the aqua and open shelves. I would love for you to come and share this at my Winter Blues Wednesday party going on right now. Hope to see you there. Hi Jessica…. found my way here from Savvy Southern Style. I love the open cabinets. I have almost an identical layout in my kitchen and wondered how it would look if I opened up two of my cabinets, since the one on the right has 2 doors and the one on the left has only one. After seeing yours, I’m going to go for it! Also…. I’m gearing up to paint my cabinets and I love the sounds of the Nuvo system. May I ask how your cabinets are holding up? Is the paint wearing well and are you happy with it? Nice touch. It just looks great! Good luck with the countertops. I just love what you did with the cabinets! You did a fabulous job. Love it, love it, love it! I LOVE that color combination! If my kitchen looked like that I would cook all the time. Also, congrats on becoming a contributor to Tatertots and Jello! That blog is one of my favorites as well. I host a link party every Thursday – I’d love you have you join and share this. It take that kind of bravery to make cool things happen. The changes are dramatic and so fun! Wow! These cabinets look awesome! I can’t believe it only cost you $53 for such a huge impact! Great job! These look great! LOVE the pop of blue!! Great change! Just a word of warning. I hate to be a kill-joy, but latex paint takes up to a month to cure. Especially in cooler weather. I’ve made the mistake in the past to put things back on shelves, before the paint had completely dried, and wish I hadn’t. Cheers! as you did and now I have the motivation..
Wow! Great update! I love that you used a blow dryer in between coats – that’s one of my moves, too. Love how this turned out!! I did my pantry with a different color back wall. Never thought of this!! Stopping by from Happy Hour! I guess I had better go check out Tatertots and Jello – 2 words I never thought I would type together. I want to do something similar, but I haven’t had the nerve. I guess I just need to go for it. 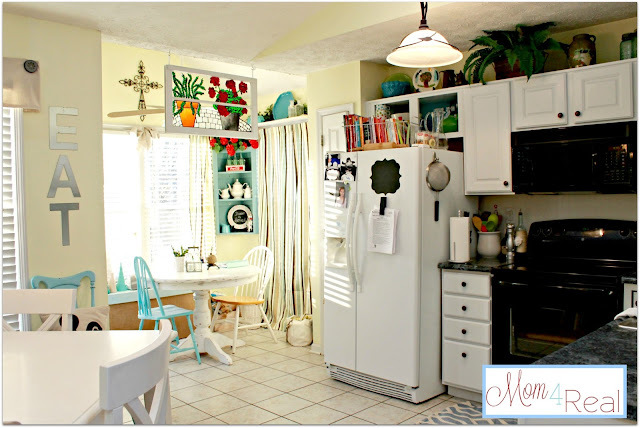 Wow–love what you are doing with your kitchen! 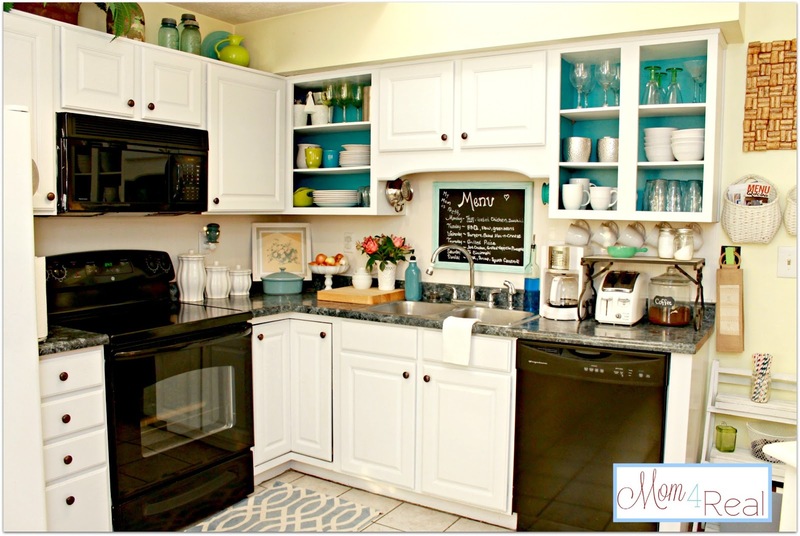 The open cabinets look fantastic–I love the color you used on the inside. Looking forward to seeing what you do on your counters! Your open shelves are beautiful! I’m so glad you took the risk because it looks really great, adds the perfect pop of color and it looks so good against the white. And yay! Congrats on being a TT&J contributor!!! Wow this looks amazing and so fun and cheery. What a great place to hang out and cook in your kitchen. Enjoy the fun new update! THat is just beautiful! I came over from Savvy Southern Style cause I just had to pin this! Un lavoro fantastico,ora la tua cucina ha una luce meravigliosa! Love the aqu a n the background. You are daring to open your cabinets like that. I could nt do that in my kitchen. I haven’t been able to actually comment on this, and now, that I can I have to say I’m totally IN LOVE! Your da bomity-bomb, girl! Jessica, these open cabinets are really sweet looking! I love the bold aqua you chose to use. It really brightens up your kitchen. Nice job! I love the colors and how it all works together. I am a new follower and look forward to seeing more. I wanted to do that with mine but hubby wasn’t having it. Might eventually do a glass type door but we will have to wait and see. How did you hang your cups under you cabinet? Love that! Hi, Kristina! I used cup hooks that screw into the wall. You can get them anywhere for about $3 for a pack of 10. Have a fabulous day! I love what you did in your kitchen. It’s so bright and cheery! Everything came together so beautiful!! I love this aqua color! Can you share what brand/color it is? Excited to try this! Can you tell me the color paint that you used for the cabinets at Lowes?